Cheltenham Festival is a highlight of the National Hunt season but let’s face it, the festival isn’t just about the races. If you’re wondering what to wear, we’ve put together a quick guide to stylish and appropriate Cheltenham Festival dressing with a few outfit ideas for inspiration. Cheltenham Festival is the first big racing festival of the spring and it is wise to remember that March weather is rather unpredictable. When putting together an outfit, it’s best to consider that you might be walking through a few mud patches or stuck out in the rain so practical choices are key. You won’t have fun if you’re wet and shivering! Cheltenham Festival isn’t really the place for glamorous high heels so a smart boot is a great option. Our picks include the super stylish Fairfax & Favor range – we’ve gone for the Amira in our outfits but you could also choose either the flat or heeled Regina which will give you elegance without sacrificing comfort. The classic Dubarry is also a good choice as it’s smart, comfortable and perfect for wet weather. It’s a rare day at Cheltenham when one can take off their coat and bask in glorious warm sunshine so if you’re going to pick just one key item of clothing, make it a smart top layer. Tailored silhouettes are a strong look and perfect for a day at the races. Tweed is a classic choice and it’s one that isn’t going out of style amongst the country set anytime soon. A great hat will really finish off your Cheltenham outfit. You could go all out with a dramatic hat or fascinator and really grab your fellow racegoers attention but as the semi-official Cheltenham dress code states hats are generally worn with the weather in mind. Our top picks include on-trend Fedoras such as the Hicks & Brown Suffolk range, which comes in an array of stylish colours, or the Barbour Tack Fedora in grey or olive. You could also go down the equally on-trend faux fur route and choose a Helen Moore Faux Fur Pill Box Hat or Dubarry’s faux fur headband. With practicality being key to Cheltenham Festival dressing, you can really make your outfit sing with a few well-chosen accessories. A feather brooch from the likes of Hicks & Brown will add some colour as will a patterned scarf. Faux fur is most definitely in style in 2018 and will add some country chic to your look as well as keeping you warm. We love the blue hues in this first Cheltenham Festival outfit. 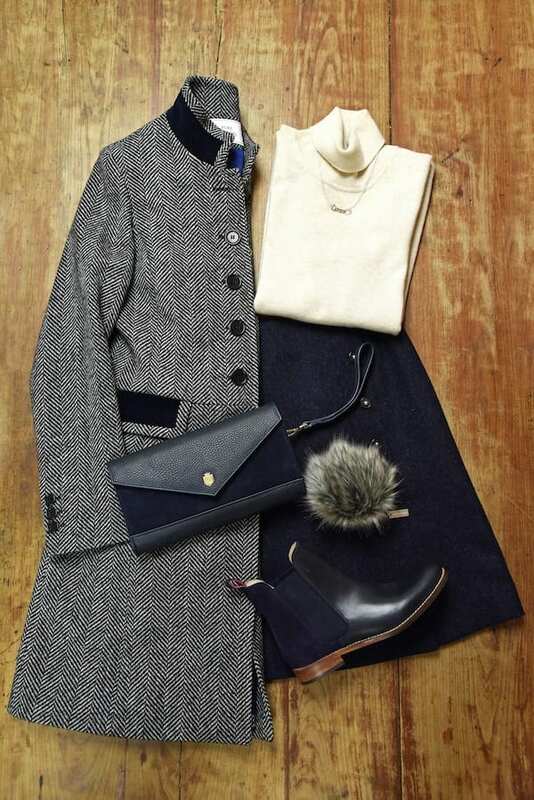 The Joules boots match perfectly with Fairfax & Favor’s gorgeous Foxley clutch and they are a smart complement to the Pinta herringbone tweed and velvet jacket, creating an on-trend, stylish look for a day at the races. We’re sorry but this particular jumper has been discontinued. Why not try the Dubarry Boylan Cable Knit instead? 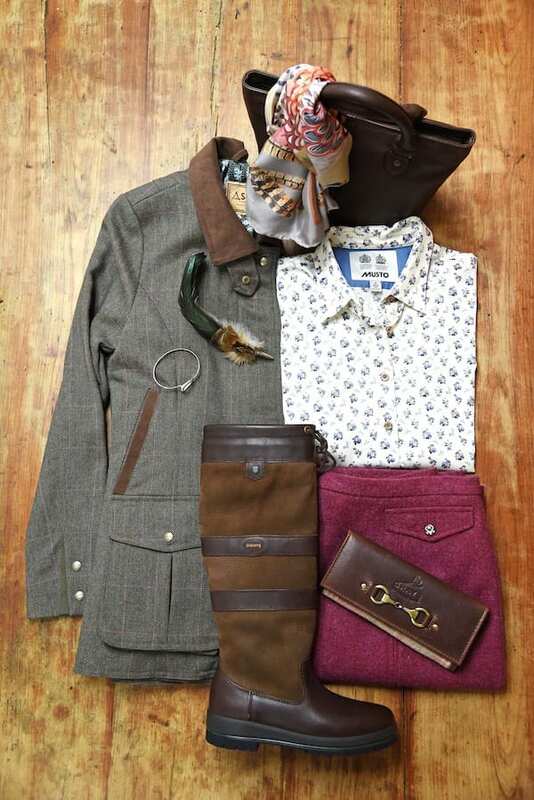 Classic country colours are a winner when it comes to Cheltenham Festival dressing. 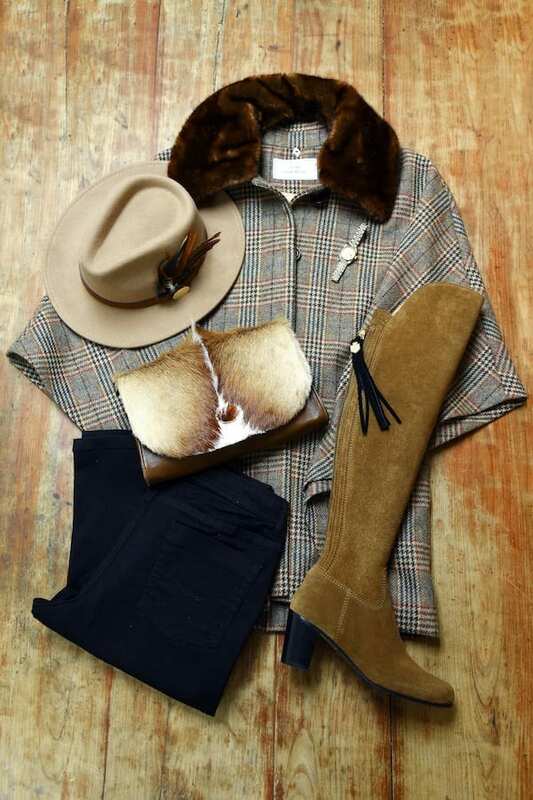 This Hicks & Brown camel Fedora paired with Fairfax & Favor tan Amira boots is one of our favourite looks this season. Throw in some faux fur courtesy of this Pinta cape and you’ll be the victor in the fashion stakes. Don’t forget, you can switch up feather and tassel accessories to add a little colour. Outfits that are both practical and stylish are all the rage at Cheltenham. The Dubarry Galway boots and tailored Schoffel tweed jacket have country style in spades and they’ll keep you warm and dry to boot. Make the most of wearing stylish layers and team outerwear with accessories like this luxurious patterned silk scarf from Bhoid and a feather brooch from Hicks & Brown and you’ll be set. We’re sorry but this particular purse has now been discontinued. Why not take a look at the Dubarry Dunbrody Leather Purse instead? Want more? We’ve put together more outfit suggestions especially for the 2019 season as well as men’s outfit ideas, and inspiration for Cheltenham Festival dressing on a budget HERE. Are you heading to Cheltenham Festival this year? We would love to see your photos! Share them with us via Facebook or Instagram.